Annuals; sparsely hirsute basally (at least on petiole of basal leaves), often glabrous distally. Rhizomes absent. Stems erect, ascending, or decumbent, unbranched or branched basally and/or distally, (0.3-)1-3.5 (-4.5) dm, (not flexuous). Basal leaves (persistent to anthesis), rosulate, (5-)8-15(-22)-foliolate, (2-)3.5-15(-17) cm, leaflets petiolulate; petiole 0.5-5 cm, (ciliate); lateral leaflet blade oblong, ovate, obovate, or orbicular, smaller than terminal, margins entire, repand, crenate, or 3-lobed; terminal leaflet (petiolule 0.2-1 cm), blade reniform or orbicular, 0.4-2 cm × 6-30 mm, margins entire, repand, dentate, or 3 or 5-lobed. Cauline leaves 1-4(-6), compound as basal, petiolate, [(0.5-)1.2-5.5 (-7) cm, including petiole], leaflets petiolulate; blade base not auriculate; leaflets similar to basal. Racemes ebracteate. Fruiting pedicels erect to ascending, (2-) 3-10(-14) mm. Flowers: sepals oblong, 1.5-2.5 × 0.3-0.7 mm, lateral pair not saccate; petals (sometimes absent) white, spatulate, 2.5-4.5(-5) × 0.5-1.1 mm; (stamens usually 4, lateral pair often absent, rarely 5 or 6); filaments 1.8-3 mm; anthers ovate, 0.3-0.5 mm. Fruits linear, (torulose), (0.9-)1.5-2.5(-2.8) cm × (0.8-)1-1.4 mm, (often appressed to rachis); ovules 14-40 per ovary; style 0.1-0.6(-1) mm. Seeds light brown, oblong or subquadrate, 0.9-1.3(-1.5) × 0.6-0.9 (-1.1) mm, (narrowly margined). 2n = 16. Flowering Feb-Jul. Roadsides, clearings, disturbed sites, slopes, cedar glades, mixed woods, meadows, fields, waste grounds, damp places, grassy areas; 0-700 m; introduced; B.C., Ont. ; Ala., Ark., Calif., Conn., Del., D.C., Fla., Ga., Ill., Ky., La., Md., Mass., Mich., Miss., Mo., N.J., N.Y., N.C., Ohio, Okla., Oreg., Pa., S.C., Tenn., Tex., Utah, Va., Wash., W.Va.; w Eurasia; introduced also in Central America, South America, e Asia (Japan), South Africa, Australia. Herbarium specimens of Cardamine hirsuta have been misidentified as C. oligosperma. 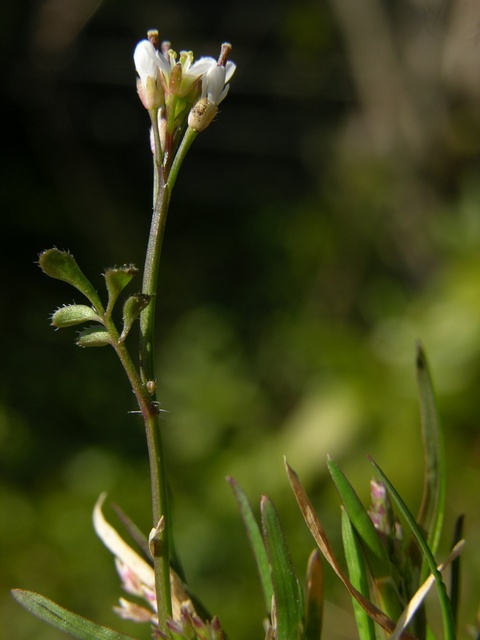 Annual herb with a taproot 10 - 40 cm tall Flowers: in a branched cluster, stalked, white, 2 - 3 mm long. Sepals four, green. Petals four, longer than sepals. Stamens six. Fruit: a narrow pod, upright on an ascending stalk, 1.5 - 2.5 cm long. Stems: multiple, upright, typically unbranched, green or sometimes purplish, round in cross-section. Basal leaves: numerous, usually in a rosette, pinnately divided, persistent, sometimes shallowly few-lobed. Terminal leaflet rounded to kidney-shaped. Stem leaves: two to five, alternate, pinnately divided, stalked. Leafstalks with a fringe of hairs, usually at base. Lateral leaflets reverse egg-shaped to oblong to linear- spatula-shaped, with one or two teeth along the margins, usually hairy above. Similar species: The similar Cardamine parviflora, C. parviflora var. arenicola, and C. pensylvanica differ by not having a marginal fringe of hairs at the base of the leafstalks (on stem leaves). Habitat and ecology: Introduced from Europe. A common weed found in cultivated ground. Has also been found in waste ground and along railroads. Etymology: Cardamine comes from the Greek word kardamon, which refers to plants in the cress family. Hirsuta means hairy. Annual with glabrous stems 1-4 dm; basal lvs numerous and conspicuous in comparison with the few small stem-lvs, the pl appearing subscapose; terminal lfl of basal lvs rotund to reniform, entire to shallowly few-lobed; petioles of the cauline lvs ciliate at least at base; lateral segments of the cauline lvs gradually narrower toward the top of the stem, obovate-oblong to linear-spatulate, often with 1 or 2 teeth, commonly hirsutulous above; pet white, 2-3 mm; pedicels narrowly ascending; frs erect, 1.5-2.5 cm; 2n=16. Widely distributed in the Old World; naturalized in moist, especially sandy soil from s. N.Y. to Ill. and Ala. Mar., Apr.